With Summer behind us, and cooler days ahead, there’s no better time than now to grab your camping gear and head out for a weekend camping trip. The lower temperatures and fewer insects make for more pleasurable camping. And of course one of the most compelling reasons to get out there and camp is to experience the beauty of the leaves changing color. 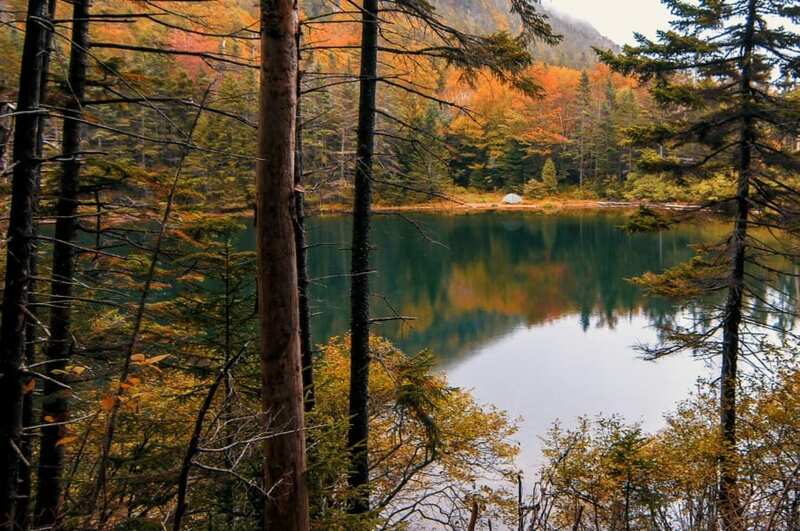 Whether you need some new gear for your camping kit or are replacing worn out pieces, these products will help ensure you have a fantastic Fall retreat. 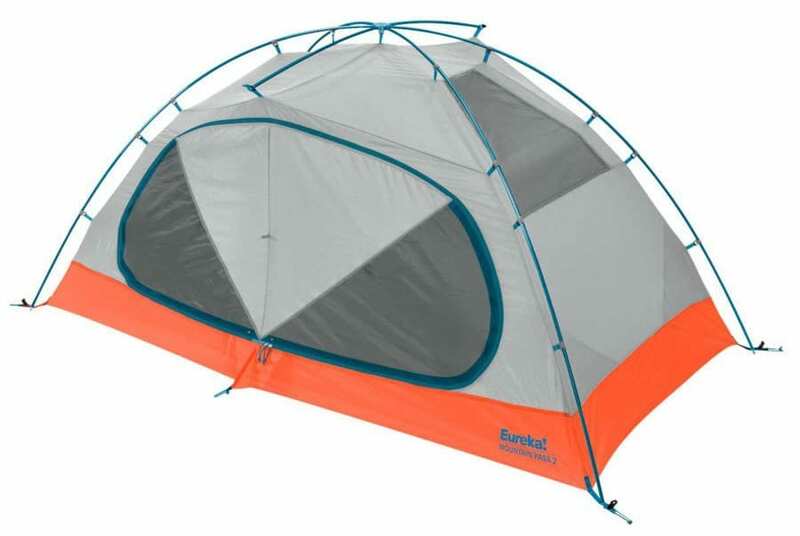 A perfect go to for camping trips all year round, the Eureka! Mountain Pass 2 is a 3+ season tent, meaning that it handles the heavy rainy weather with ease and can deal with most winter conditions. Whether heading out solo or sharing with a partner, the Mountain Pass is the ideal all in one size and weight for both the car camper and curious backpackers and when you are ready to test out a longer backpacking excursion, ditch the rain-fly for the lightweight fast-pitch option and lighten the load like a seasoned backpacker. The Eureka! 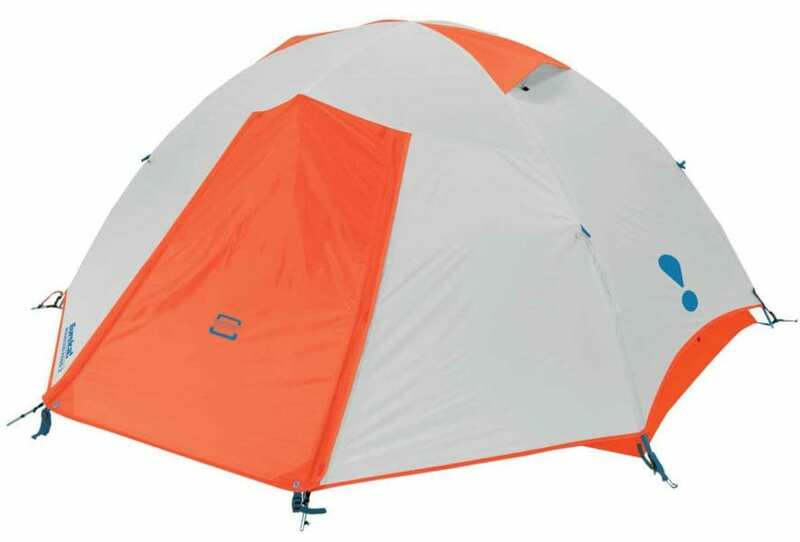 Mountain Pass 2 Tent offers ample room for up to 2, it provides 32 square feet of interior space with doors on each side so that you and your partner can comfortably move in and out without having to crawl over each other in the middle of the night. In front of each of the two side doors, you’ll find additional protected vestibule storage space. 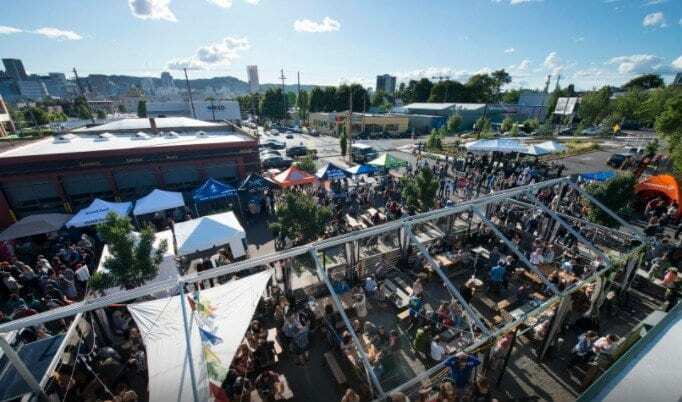 The larger of the two provides 10.8 square feet of space and the smaller of the two offers 7.6 square feet. The internal pockets and included gear loft maximize floor space by giving you a place to store clothes and other gear. The high-low air flow ventilation and mesh windows help prevent overheating and condensation build up. Remove the rain-fly, unzip the windows and you get a true back country experience that allows for star viewing and waking up to the sun. Beginners will appreciate the simple color coded setup and one pole light weight aluminum design, while more advanced campers will admire the small details that Eureka! put into the Mountain Pass that makes easy work of tent camping. 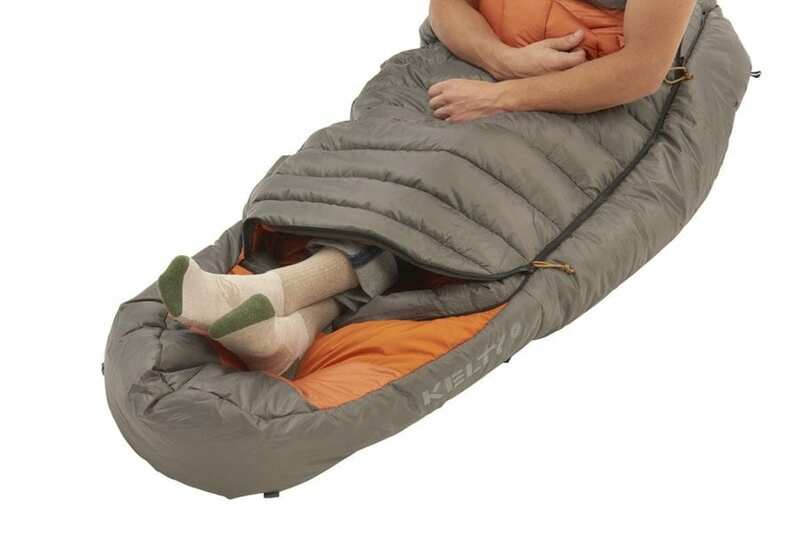 Avoid the cold and an empty wallet with the Kelty Tuck 0 Degree Sleeping Bag. 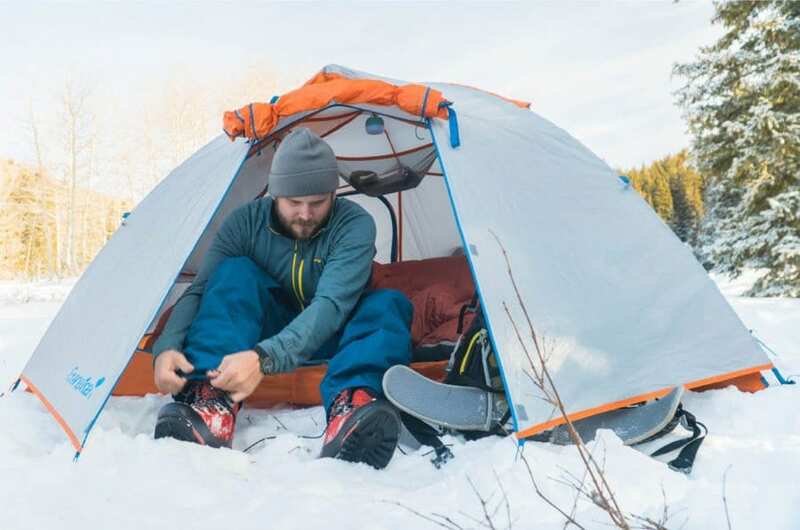 Kelty keeps the price low and the versatility high with ThermaPro Ultra Synthetic Insulation, a synthetic alternative to down that delivers the perfect blend of warmth and compressability. The Kelty Tuck is easy to care for and maintains its high loft, softness and insulating properties even after repeated uses. Unlike down fill, it also continues to provide insulating warmth even if it becomes wet. The shell is built with a soft 75D Polyester Taffeta for durability enabling this bag to stand up to seasons of abuse. The one feature that makes this bag a favorite is the unique Comfort-Tuck Zipper which wraps around the bag just above the foot-box allowing you to untuck your feet. If it’s a cold Fall night in the high country or a warm spring morning in the outback, the Tuck zipper is equipped to deliver comfort in either situation. This also allows you to hike up the foot-box and walk around the campsite so you don’t have to bare the cold while you wait for the sun to warm the day. The thermal comfort adjustable hood customizes coverage, and the mummy bag packs down into a compact package for easy transportation. 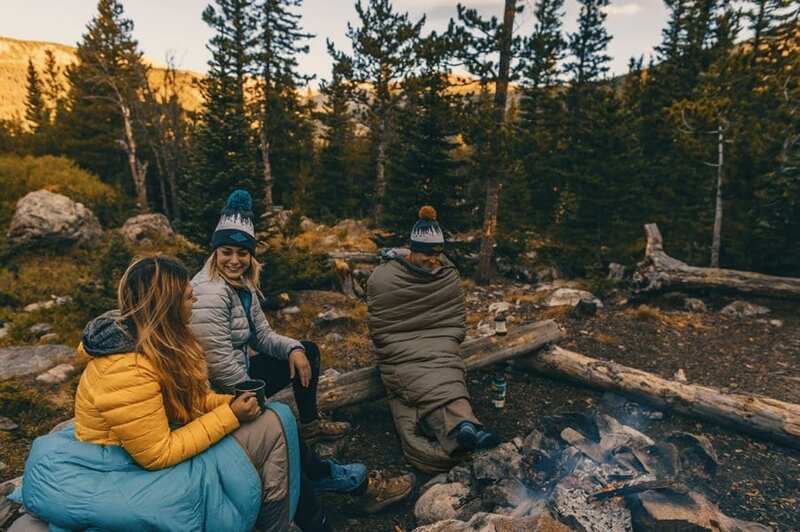 The relaxed shape and lofty insulation will keep you comfortable and warm on every Fall camping trip, and it comes at a price that won’t break the bank. Added insurance for chilly nights. 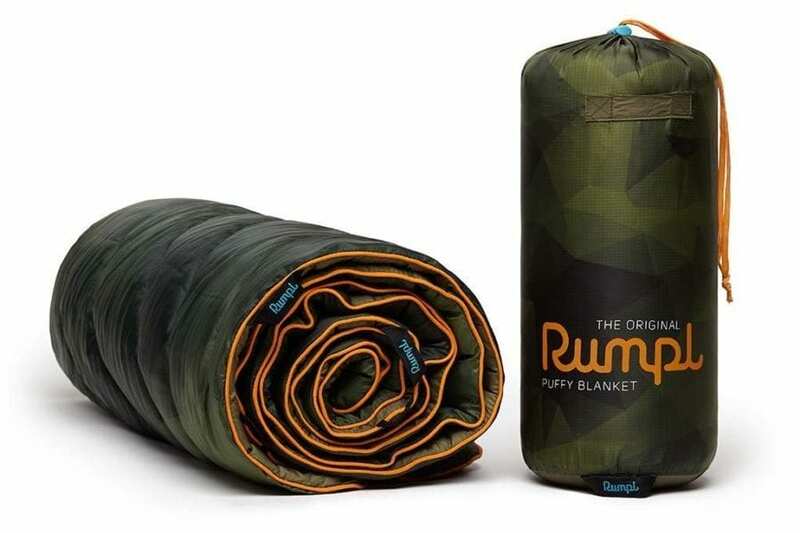 The Rumpl Original Puffy Blanket is one of those items that everyone should have in their camping kit, with a multitude of uses; from extra warmth on cold nights, to ground coverage for picnics or even a pillow when it’s not needed as a blanket. 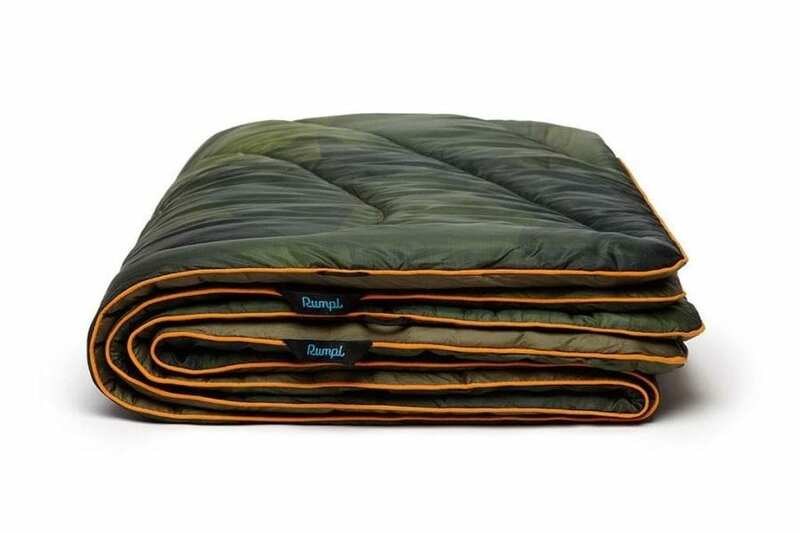 The blanket is built with the same technical materials found in premium sleeping bags and insulated puffy jackets, providing warmth in any environment. 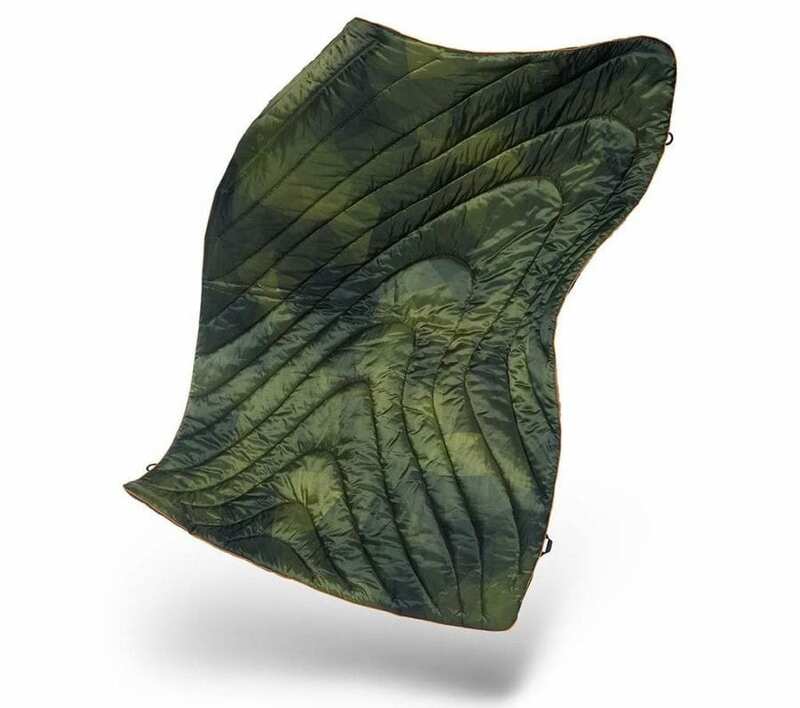 It is built for camping and outdoor adventures with its durable rip-stop material that can withstand rough outdoor surfaces, and even shrug off the morning dew, thanks to it’s water-repellent finish. When it’s time to leave, it easily packs into the included stuff sack and will be ready for wherever you are off to next. 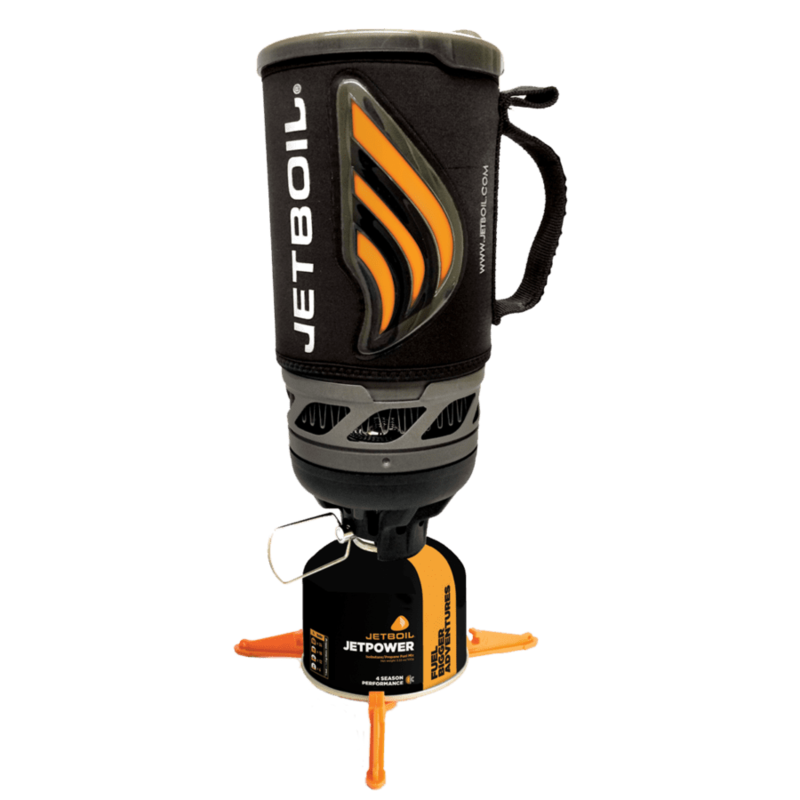 Everything you need to cook on the go is stacked and stored inside the Jetboil Flash 1 liter cooking cup. The system lights with the click of a button and within 100 seconds provides 2 cups of boiling water for coffee, instant soup or a gourmet meal. 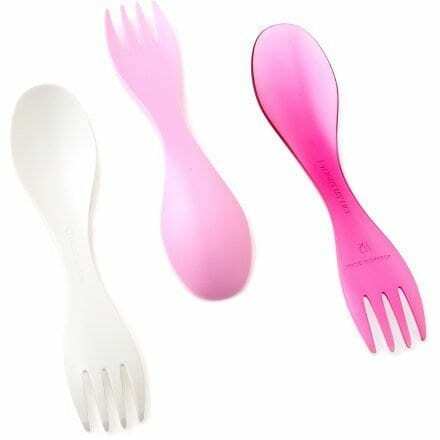 The Flash is one of the safest and most convenient cooking solutions out there. The cooking cup clips onto the burner, preventing accidental spills, and the fuel canister tripod ensures overall stability. Unlike classic camp stoves, this self-contained unit eliminates the issues of an open burner and takes the guesswork out of a quick meal thanks to the thermochromatic, color-change heat indicator on the insulating cozy, letting you know exactly when the water boils. Finish your food, pack the fuel canister inside the insulated mug, and stow the whole kit away in compact style. 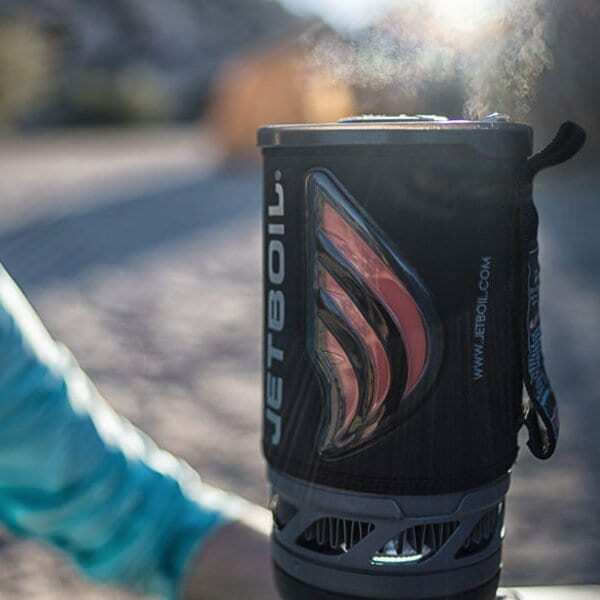 It truly is the ultimate personal cooking system for dehydrated meals, soups, and coffee. 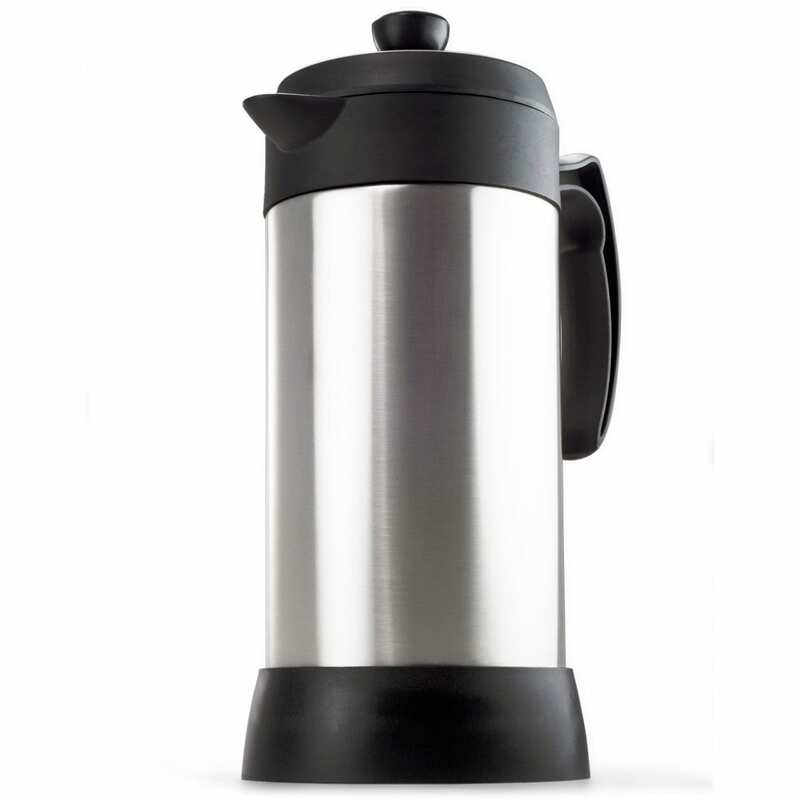 Coffee connoisseurs take note: there is a coffee press attachment perfect for brewing the quickest batch of coffee on the go, anywhere you like. 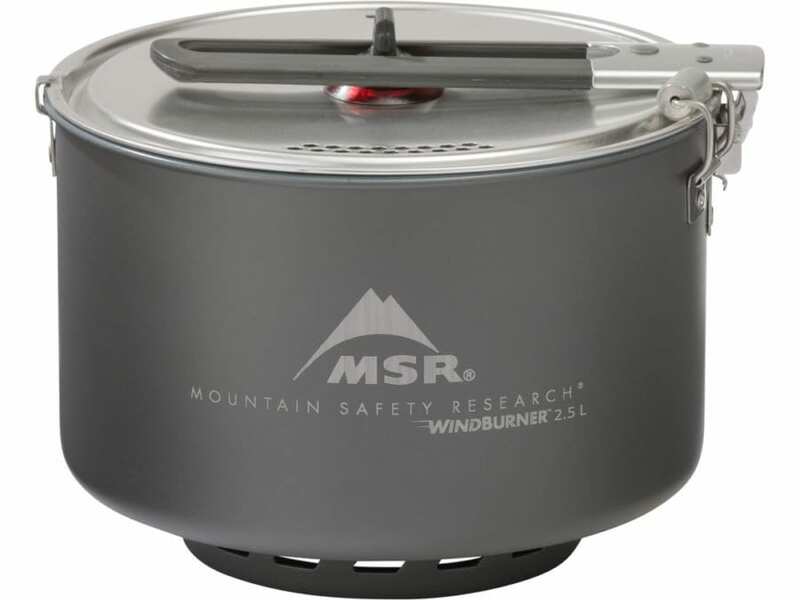 Whip up dinner for a group or boil a pot of water fast when you’re cooking with the MSR WindBurner Stove System combo. It combines the ultra-efficient performance of the WindBurner stove technology with the ultimate tools for back country cooking. 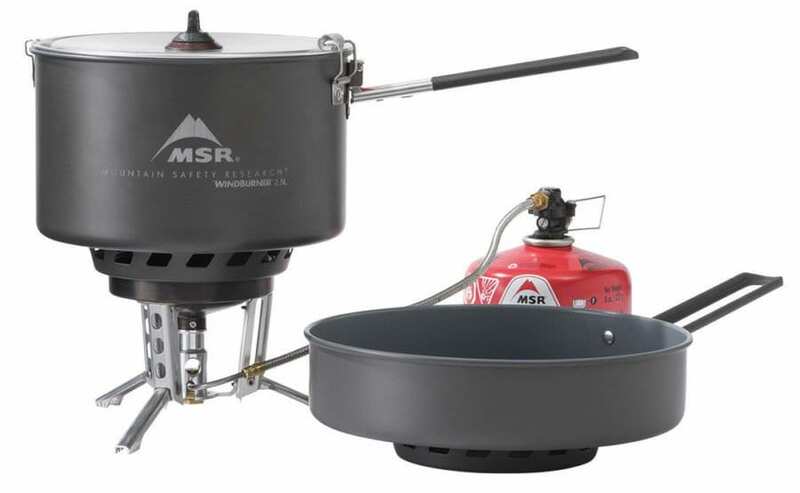 Featuring a ceramic-coated 2.5 L sauce pot and an 8” skillet, this modular stove system provides simmering and cooking versatility that is perfect for small groups. 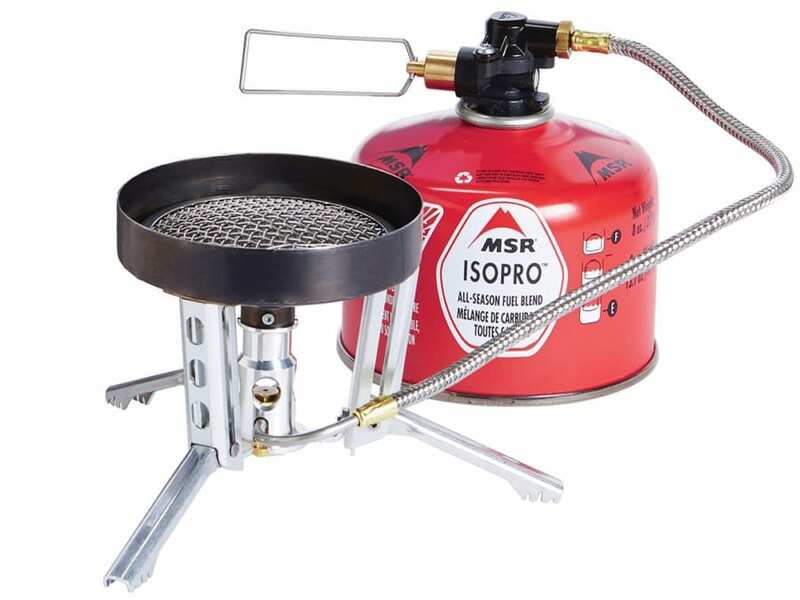 The MSR WindBurner Stove System has a wind proof, pressure-regulated radiant burner that maximizes the life of every fuel canister and delivers a consistently high level of performance even in windy conditions. 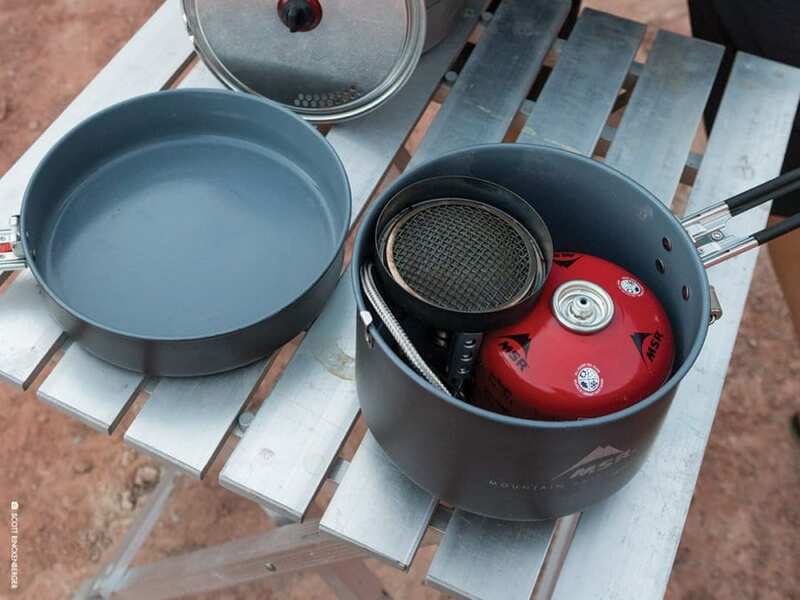 It’s remote-canister stove design makes for rock solid stability when cooking with taller and larger-volume pots, minimizing the chances of toppling over a meal. The system’s modular design nests all of its components and locks shut for easy storage when it’s time to move on to the next camp site. 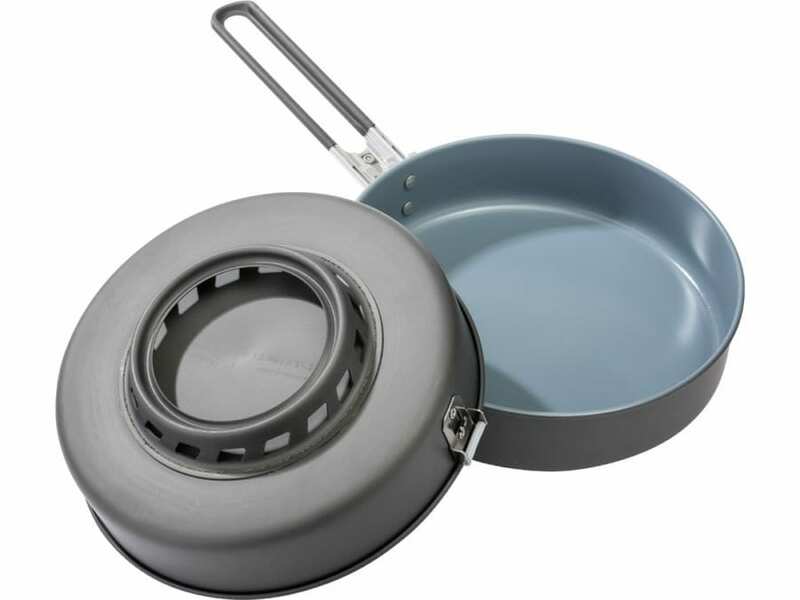 Multi Use: 2.5 L sauce pot & 8” skillet feature ceramic-coated nonstick/easy clean surface and an enclosed, heat-capturing ring for simmering & cooking versatility. Water filtration done easy. 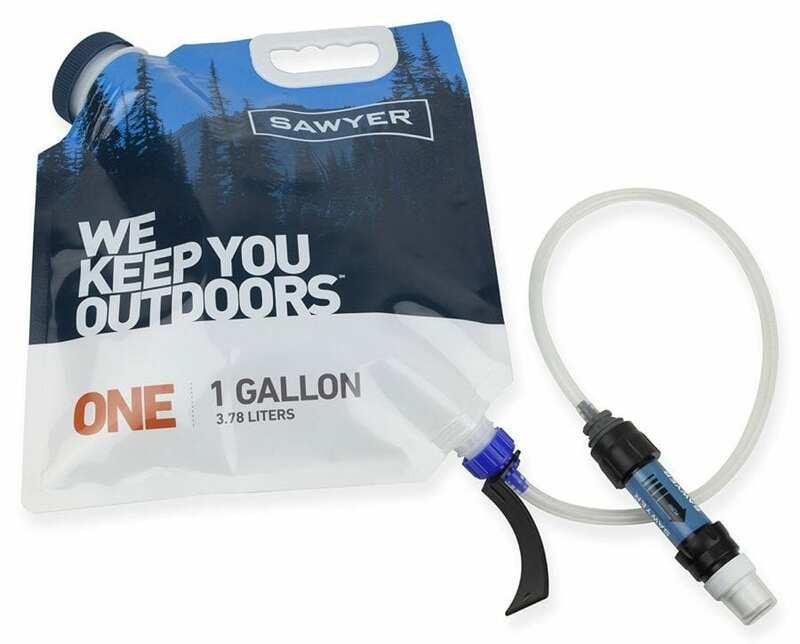 Collect, filter, and store your water in the back country with the quick and convenient Sawyer’s 1-Gallon Gravity System. This lightweight solution lets gravity do the work and cleans large quantities of water in as little as 7 minutes. The wide-mouth opening makes for easy filling from lakes, rivers, or the tap, and the integrated handle allows for easy hanging while it filters. The system comes with a MINI filter that is threaded on both sides, allowing you to screw the push/pull cap onto the MINI for easy on/off functionality while filtering to control water flow. The MINI filter is rated to filter up to 100,000 gallons and the filtering membranes are sturdy enough to withstand back-washing using the included syringe, restoring up to 98.5% of the filter’s flow rate. Included with this system is also a cleaning coupling accessory, that allows you to connect a standard plastic bottle enabling you to backwash the MINI, which can be cleaned and reused almost indefinitely with no expensive cartridges to replace ever. 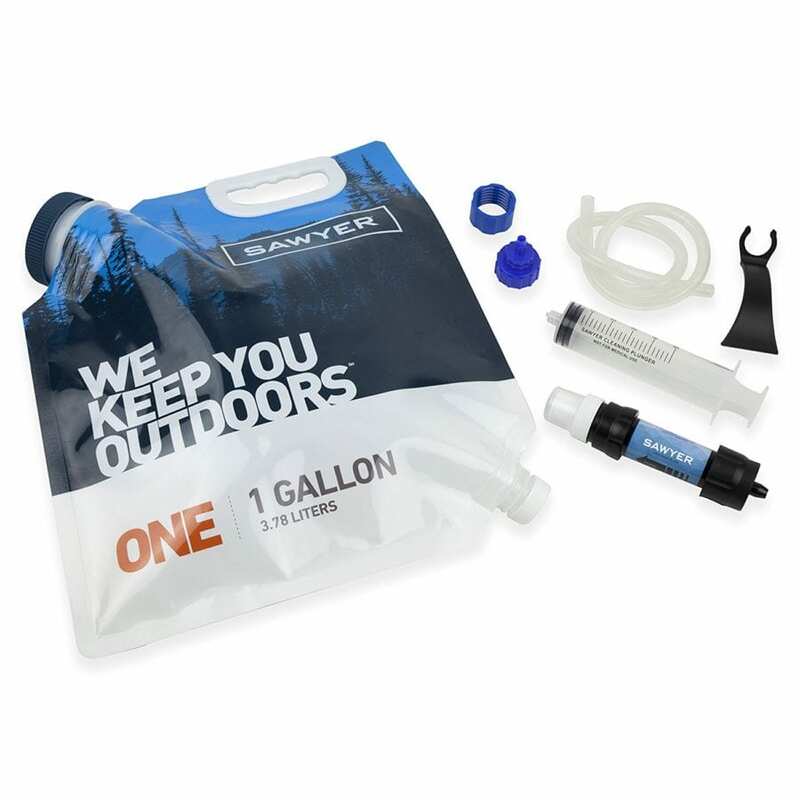 Easy to use and quick to work, the Sawyer 1-Gallon Gravity Water Filtration System is your ticket to clean water when you are camping in the back country. 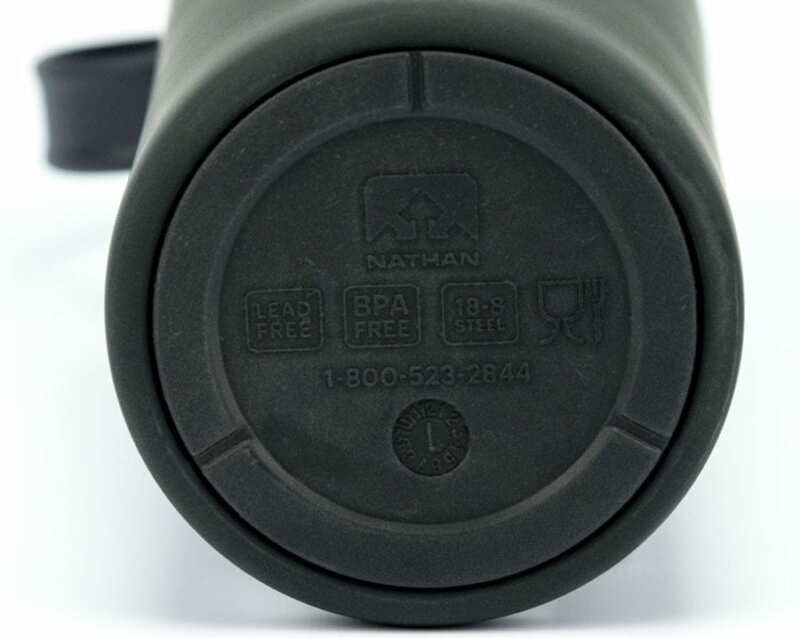 Keep beverages at their optimal temperatures with the Nathan Sports HammerHead 24 oz. 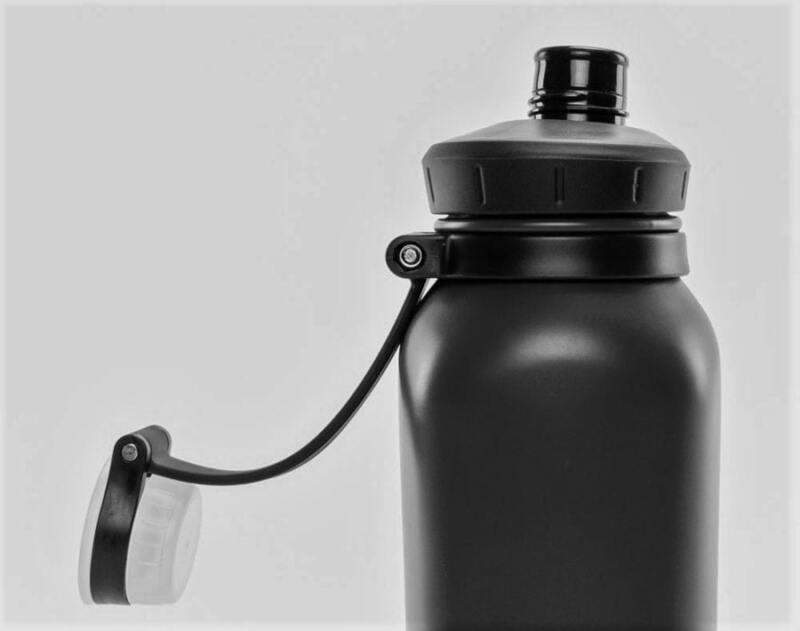 Steel Insulated Water Bottle. The triple-insulated, rugged, round-to-square steel design construction will keep your cold drinks chilly for over 24 hours and even longer when you add ice through the easy loading wide mouth opening. Early morning coffee will stay hot for those all day hikes, holding it fiery warm for up to 15 hours. The HammerHead has a rubberized mouthpiece that is ideal for sipping water or pouring coffee, and it comes with an attached twist-on cap that won’t get lost. Nathan coated this bottle in grippy, sweat-free coating, and added a non-slip bottom TPE pad to makes sure it stays put. 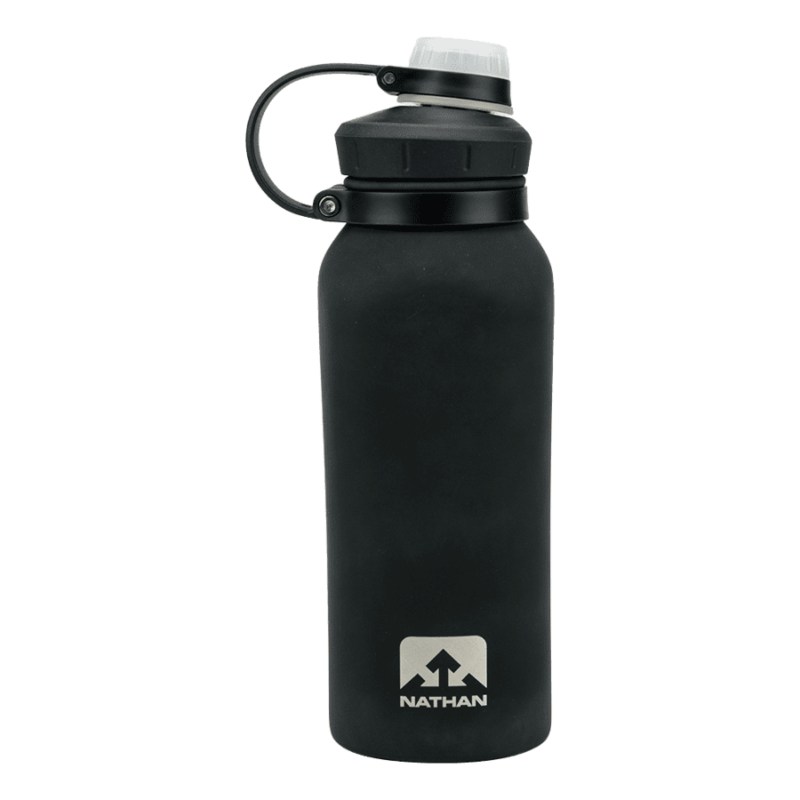 The HammerHead is equipped to take on all variations on of adventures while the no slip design and triple wall vacuum insulation keep beverage temperatures regulated and the bottle perspiration free. The HammerHead is available in 18, 24, or 40 oz. 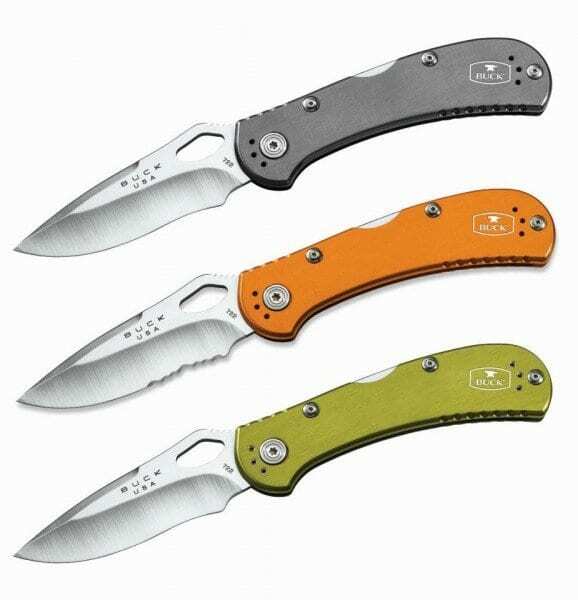 versions with a color selection that is sure to please. 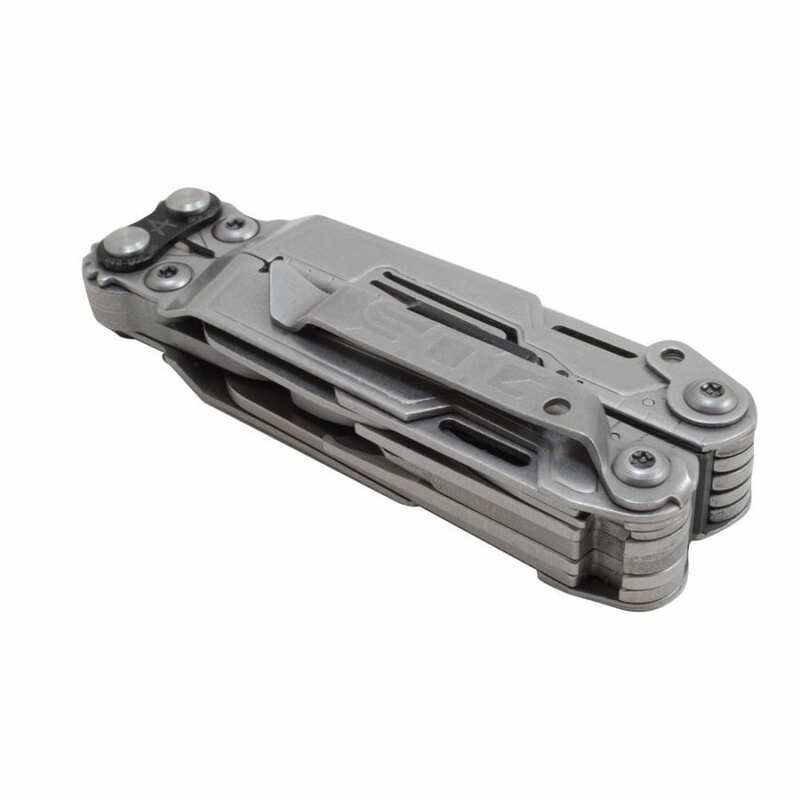 The SOG PowerPint is a mini multi-tool that delivers full-sized utility. The lightweight and compact PowerPint gives you nothing but a tough, durable package of essential tools that can fit anywhere. 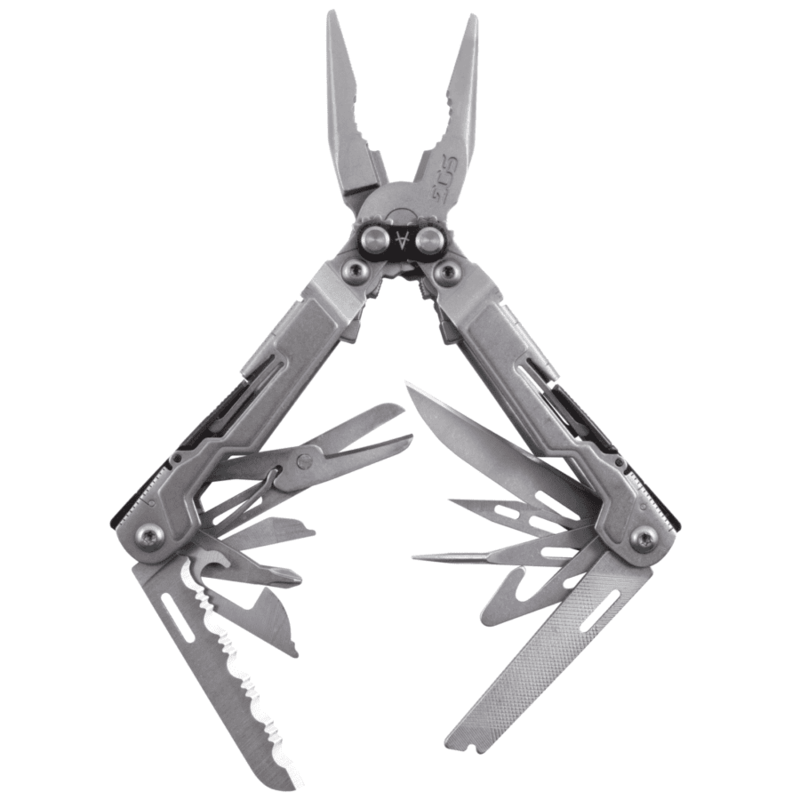 With a rugged, stainless steel frame this streamlined tool tackles any job without weighing you down. 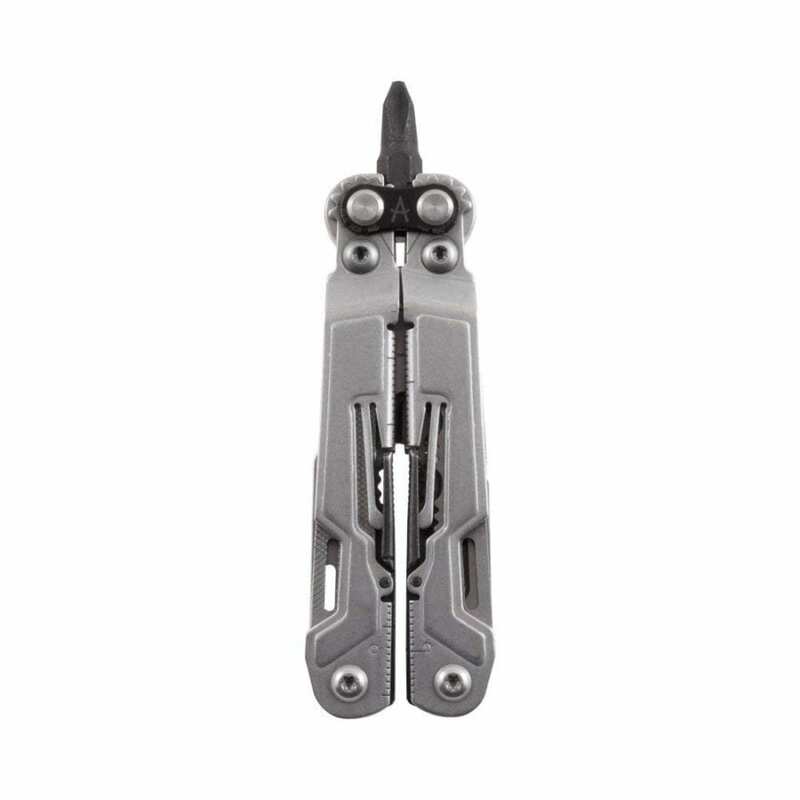 The attached pocket clip makes it easy to attach to your pack or pants, and all tools and blades lock securely in place for added safety. 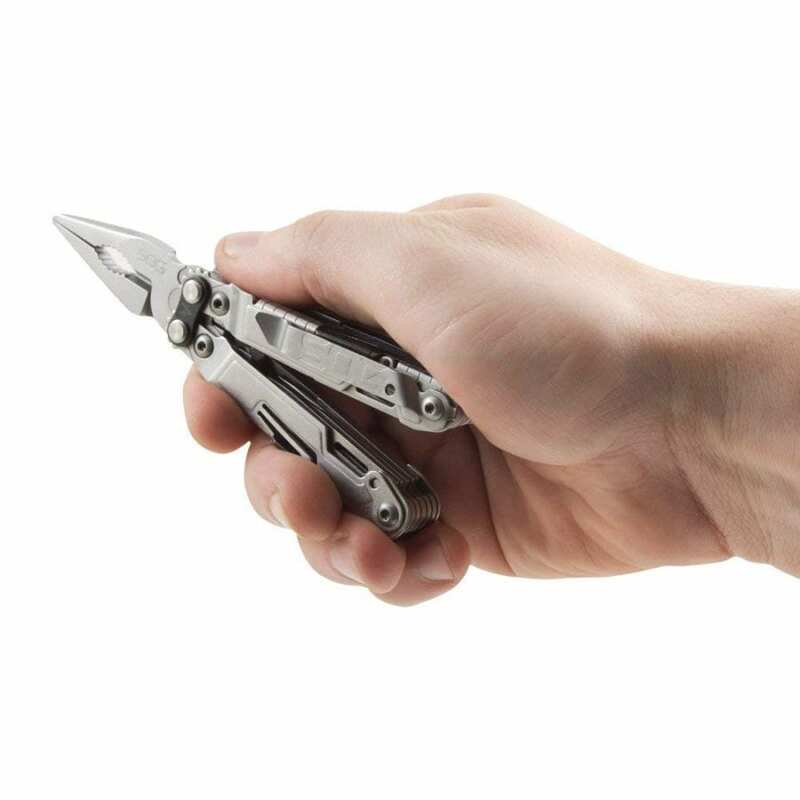 The PowerPint comes equipped with 18 tools and a magnetic hex bit holder and of-course SOG’s Compound Leverage system that provides smooth opening/closing and furnishes increased gripping power. 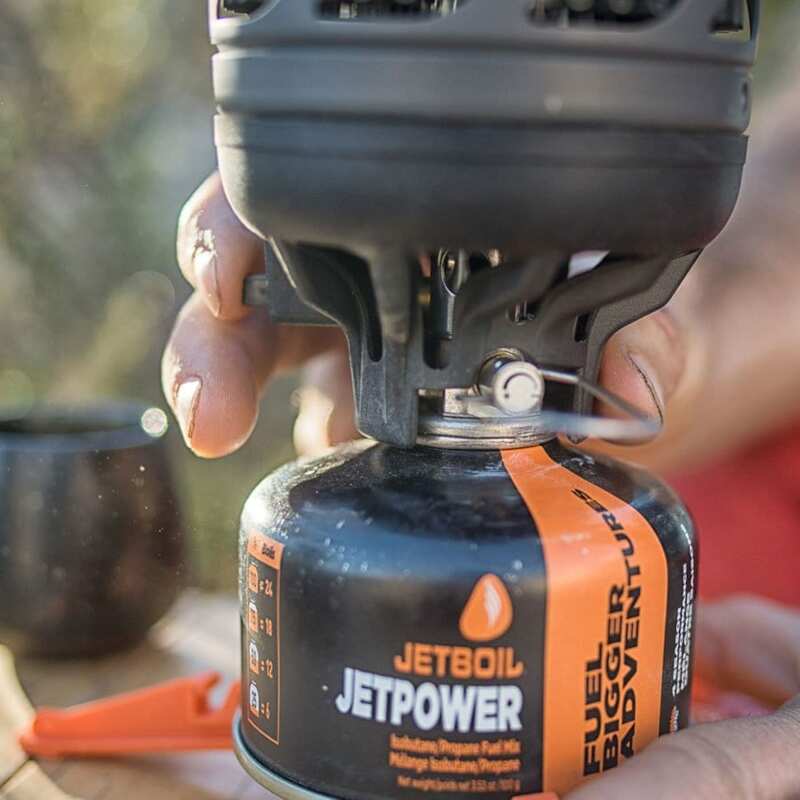 At just over 3” long (closed) and a lightweight 4.2 ounces, the PowerPint is a fit anywhere, must have multi-tasker that can easily handle gear repairs, fire kindling, and camp cooking. 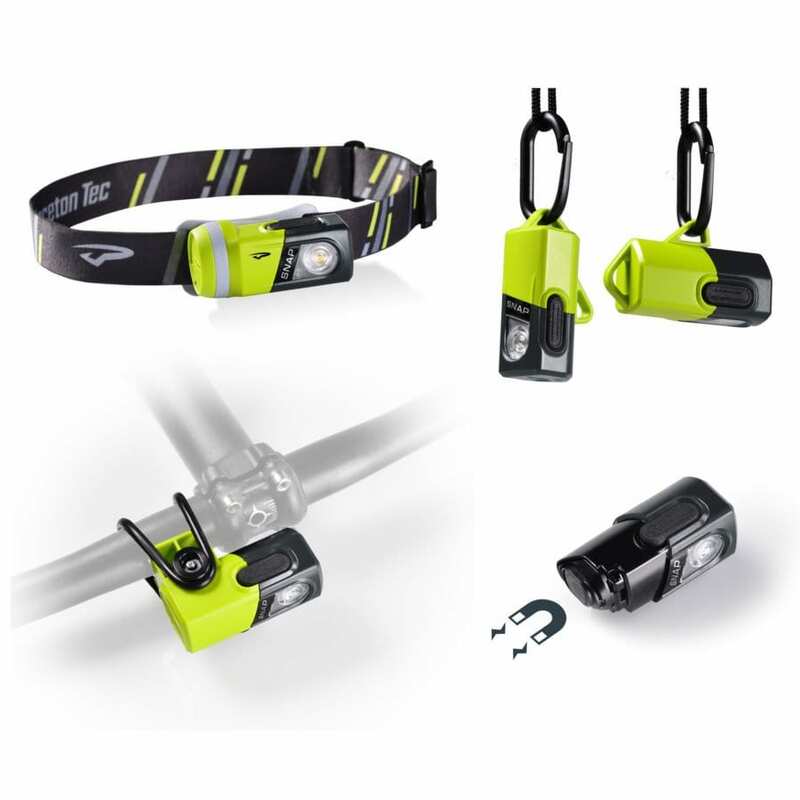 Versatile lighting done right, the Princeton Tec Snap is an intuitive modular system that allows a magnetic 200-lumen light to easily be swapped between a headlamp strap, bike mount, two-way carabiner mount or simply attach to any magnetic surface. The Snap blends multiple categories of lighting equipment into one unique system. 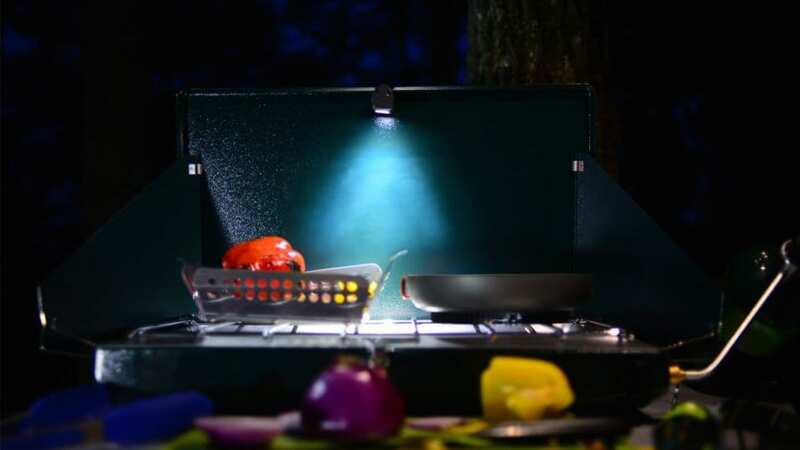 The light is easily reconfigured with different mounting brackets to adapt to the environment, whether hiking through the woods, cycling after dark, lighting up a tent, or cooking that late night camping snack. The Magnetic SnapDapter is the key component to the light’s adaptable design. The Snap excels where traditional headlamps can’t, it’s head unit is removable from the headlamp bracket for handheld operations and for use with the included accessories, snapping into place with a strong magnet that is incorporated on the back of the light. The Snap light is simple to use: a large, easy to find button on the head unit turns the versatile spot beam on, dims it and switches over to flash mode. 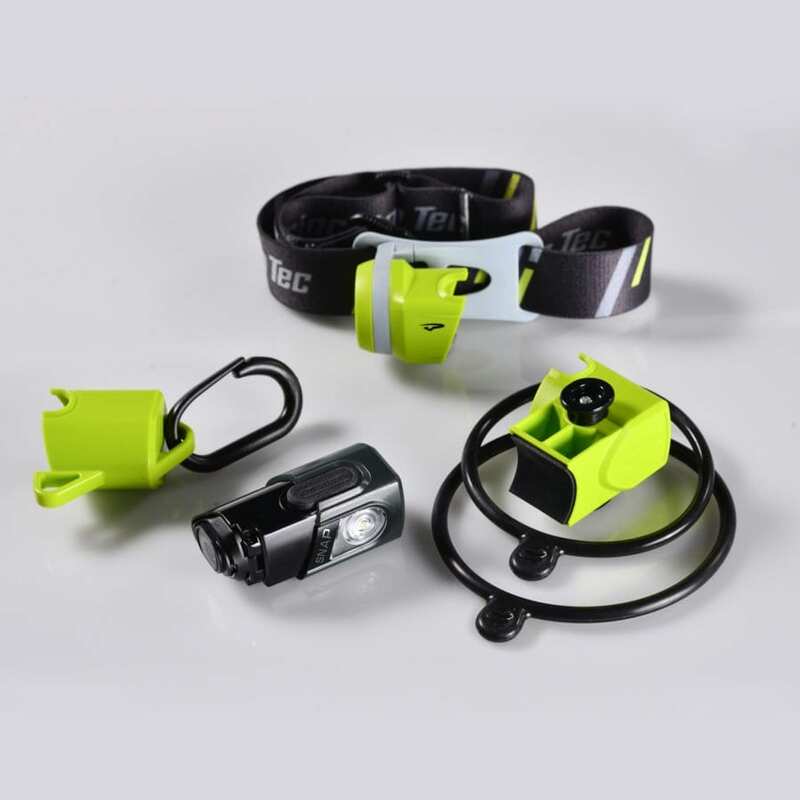 The Princeton Tec Snap is an all in one, affordable lighting solution that covers a spectrum of needs: headlamp, flashlight, bike light, safety flasher, lantern and magnetic area light. Built low to the ground and slightly reclined, the Kelty Linger Get-Down Chair provides relaxed comfort and light weight carrying convenience. 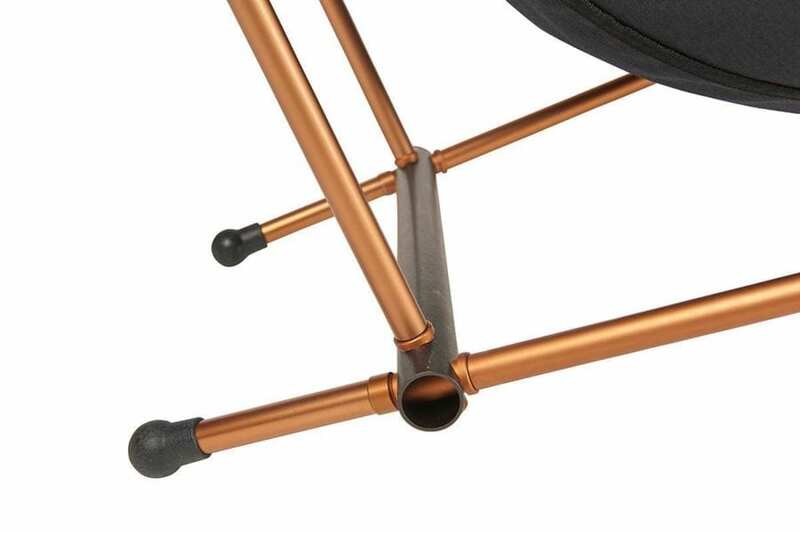 The 600D polyester chair material and extra-strong anodized aluminum shafts conveniently fold into the compact carrying case for easy transportation and quick set up. The chair’s extended height seat back provides full support for your head and it’s built-in padded headrest delivers comfortable stargazing or superb cushioning for taking those afternoon naps. 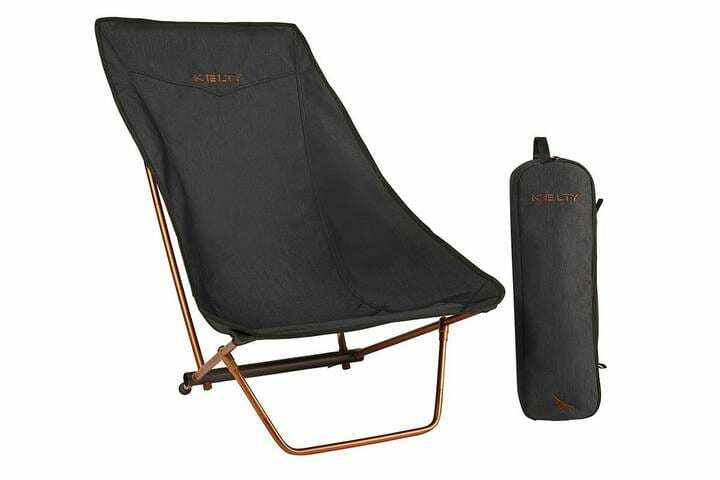 The Kelty Linger Get-Down Chair is a surefire way to induce the highest level of camping comfort, all in a light-weight, easy to carry package. 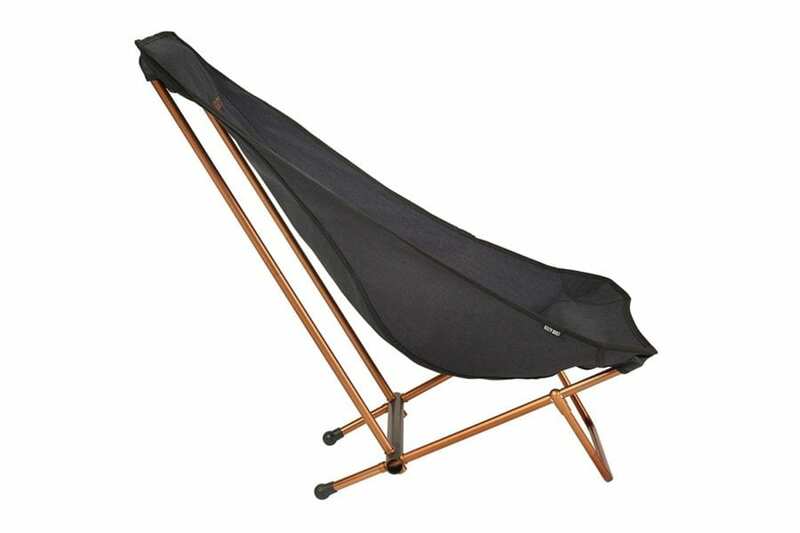 The GCI Outdoor Freestyle Rocker is a stylish and comfortable rocker made for the great outdoors. 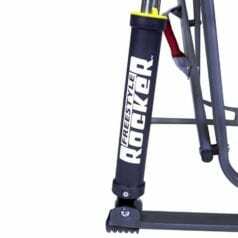 It delivers smooth rocking on any surface thanks to the Spring-Action Rocking Technology. 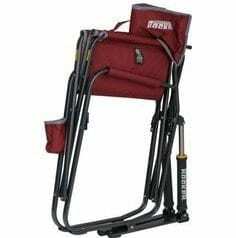 The Freestyle Rocker has a convenient carry handle and beverage holder built onto the frame. 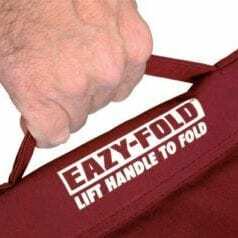 GCI designed the rocker to open and close with ease, thanks to the patent-pending EAZY-FOLD Technology, a simple push down on the seat and it is set up, a simple pull up of the handle and it is ready for transportation. 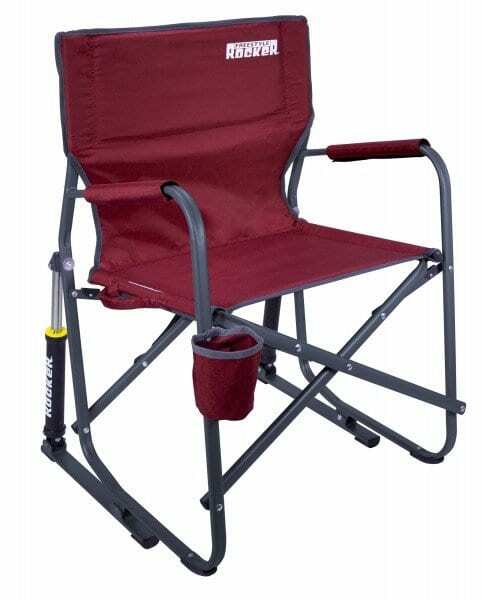 The Freestyle Rocker is constructed of lightweight powder-coated steel, making it the ideal rocker for those who want to take a rocking chair out into the elements for camping. 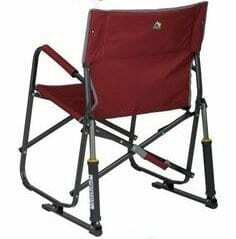 Miles from grandma’s rocking chair, the Freestyle Rocker will be the envy of any campground. A versatile, go-anywhere power source that charges just about all of your devices, the myCharge Portable Power Outlet is an essential for outdoor adventures, from remote backpacking trips to weekend camping trips. 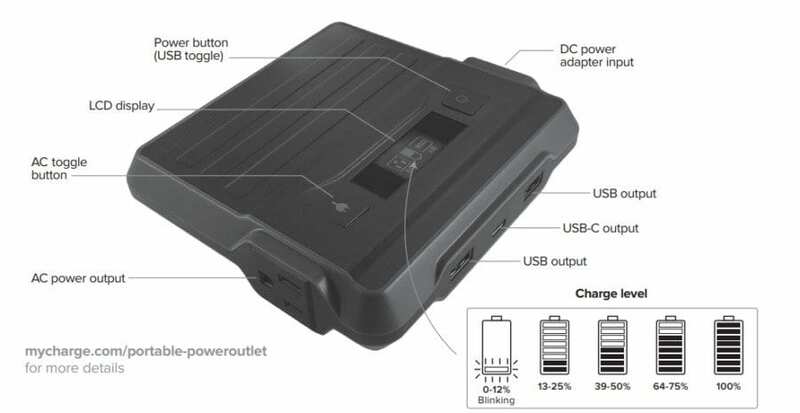 This 20000mAh Lithium Ion battery Power Pack charges from a wall plug and is equipped with a built-in AC power port, 2 USB-A charging ports and one USB-C charging port giving it the ability to charge phones, tablets, cameras, drones, headlamps and some laptops (note the maximum 65 watt output for the AC port). 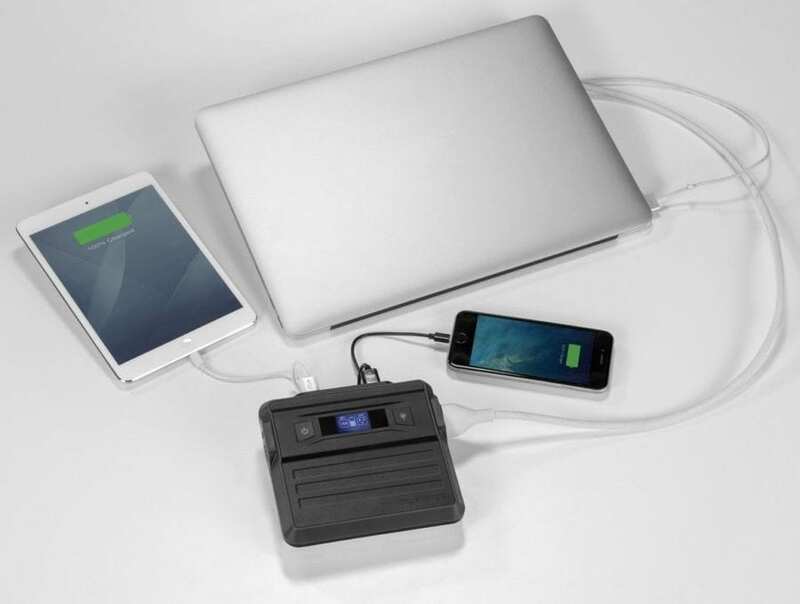 The myCharge is lightweight and easy to pack, weighing in at only a pound and a half. The included wall adapter charges up the power bank quickly so it can be ready to go within a couple of hours. myCharge designed the Portable Power Outlet to replace heavy and bulky generators used when tailgating or camping, streamlining the power source so that it can run a 34-inch LED television for up to four hours. 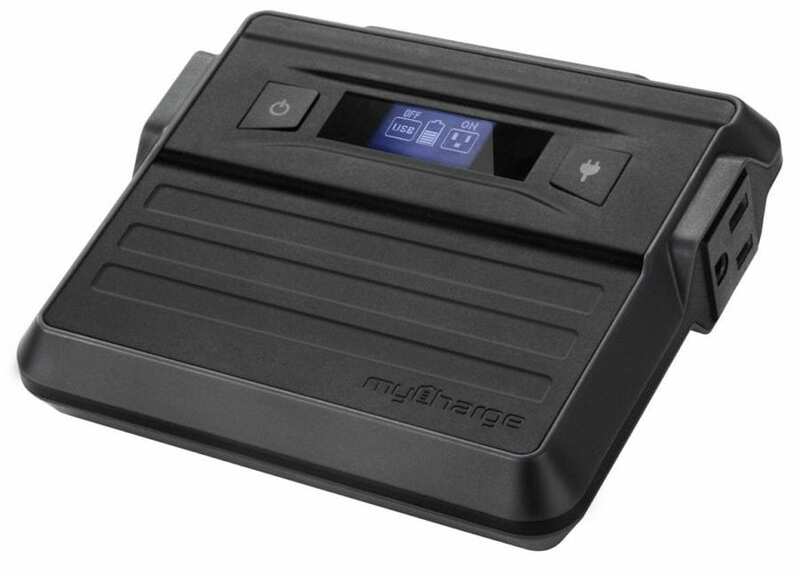 The myCharge Portable Power Outlet is the largest in myCharge’s charging hub and inverter collection and best serves backpackers and campers who require a lot of power but don’t have much space. When you’re camping around insect-infested areas and you need maximum protection, rather than turn to DEET, let me suggest this non-toxic alternative that is highly effective and aptly named Proven. 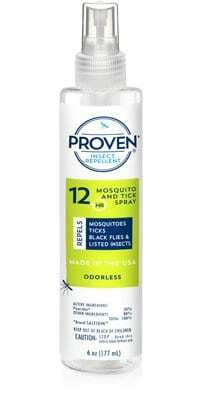 It utilizes the active ingredient Saltidin (Picaridin), which is recommended by the EPA, Word Health Organization and CDC as an effective repellent against mosquito-borne illnesses. 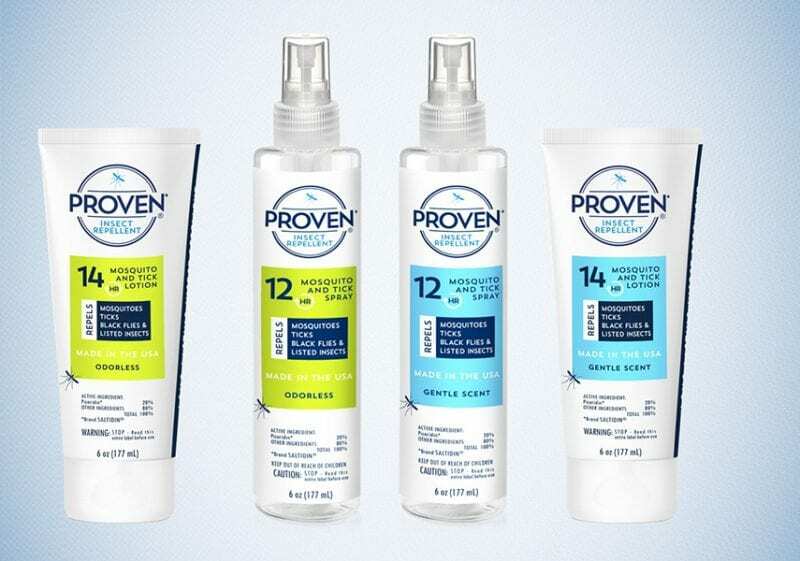 With a 20% concentration of Saltidin, Proven is more effective and longer-lasting than some higher concentrations of DEET— but non-toxic. It’s fragrance-free formula keeps the bug at bay and the smell is almost non existent. A single application of the spray lasts up to 12 hours, and the 6-ounce bottle is plenty large enough for bigger groups on extended trips. 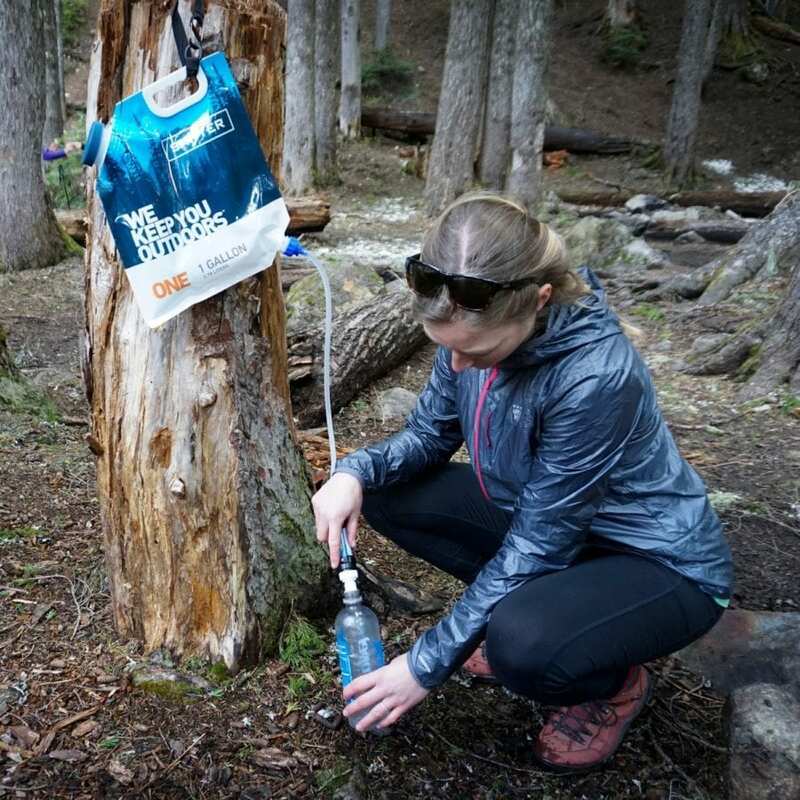 For those outdoor enthusiasts worried about their gear, Proven is gear-safe and will not melt or damage plastics like DEET can. Whether you’re heading far into the back country for a week long hike or doing some off the grid camping, ZipStitch is an item that should be in your first aid kit. 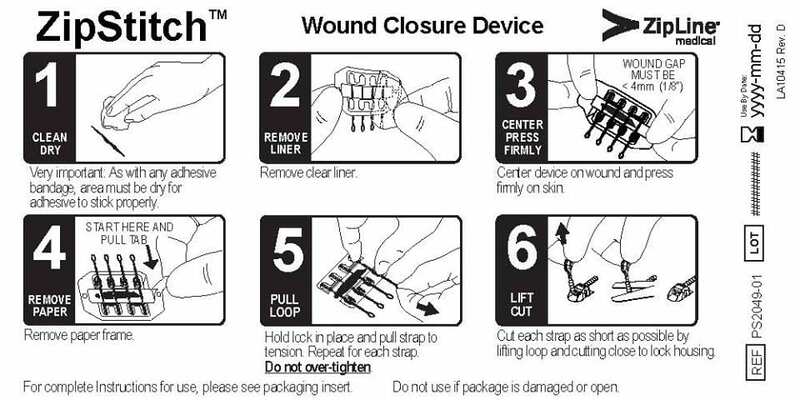 ZipStitch is the only surgical-quality wound closure device available without a prescription. It is completely non-invasive and easy to use, no matter where you may be. 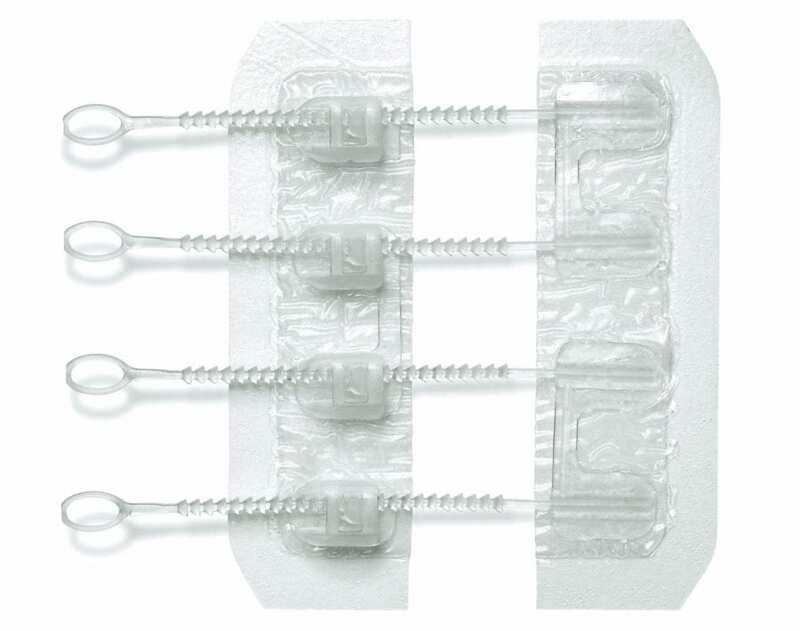 ZipStitch enables you to treat cuts that would otherwise need stitches with hospital-grade technology. 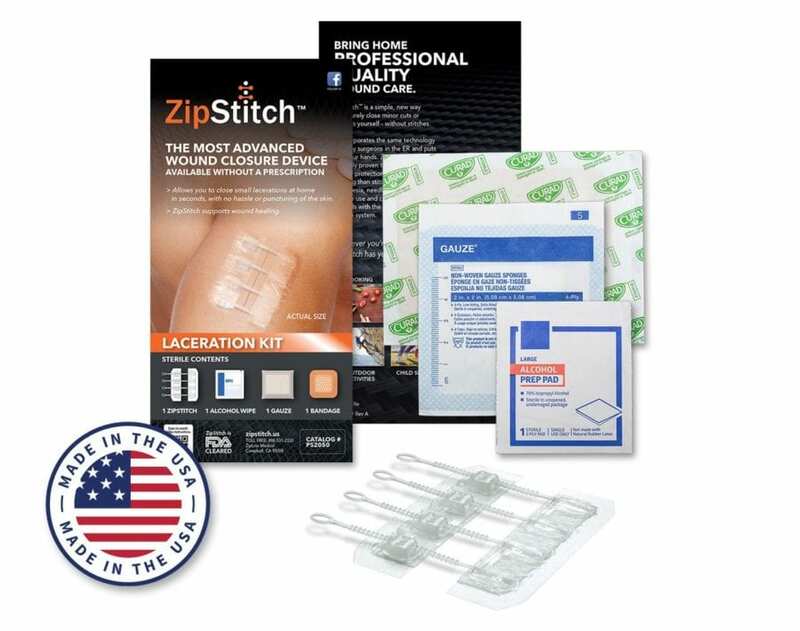 Everything you need to treat and close a stitch worthy laceration is included in a convenient, easy-to-pack envelope: ZipStitch, Alcohol wipe, Gauze pad, and Bandage. ZipStitch allows you to continue your outdoor adventure while avoiding the potential pain, hassle and out-of-pocket costs associated with a trip to the ER for stitches.